With the New Year well and truly underway, and my new stack of Christmas gift books sitting on my bedside table, I’ve looked back at my 2014 reading list and pondered my favourites. This year it wasn’t a gigantic fiction work nor an intellectual epic that had me purchasing copies for friends this year. No, this year… children’s books reigned supreme and this printed wonder went in every little persons stocking I knew. Funnily enough their delight was matched by parents, uncles, aunties, nannas, pops, baby sitters, dogs, cats and sometimes the lucky teddy who reads along before bed as well. 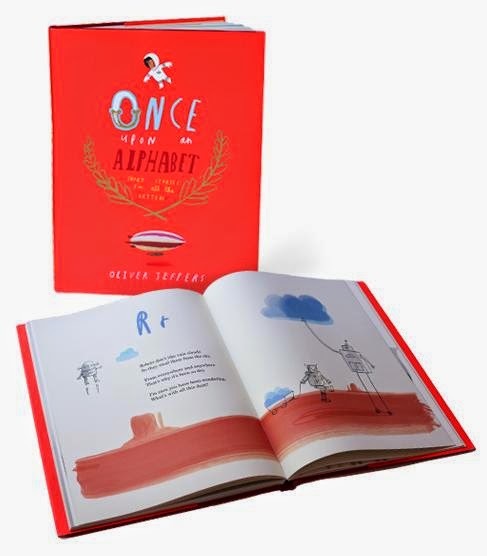 Once Upon a Alphabet by the great Oliver Jeffers made my smiling cheeks hurt. Firstly… can we just stop to judge this book by its marvelous cover? Jeffers, one of the most imaginative illustrator/story tellers of our time tells us beautifully alternative tales of each letter; subtle yet immeasurably expressive. Jeffers nods to adult readers with intelligent conundrums and glorious juxtapositions. His stories brim with the fallible and heartening humanity that makes up our vastly imperfect but mostly noble selves — our paradoxes (A is for “astronaut,” and Edmund the astronaut is afraid of heights), the silly stubbornness (B is for “burning a bridge” and we meet neighbours Bernard and Bob, who have spent years “battling each other for reasons neither could remember”), the playful flights of curiosity (E is for “enigma,” like the question of how many elephants can fit inside an envelope), the existential perplexities (in P, a “puzzled parsnip” spirals into anguish over realising that he is neither a carrot nor a potato), the self-defeating control tactics we employ in attempting to assuage our fear of impermanence (the robots in R are so terrified of rusting that they steal the rain clouds from the sky and lug them around in carts). It is a spellbinding classic and well worth borrowing whether to read to a child or enjoy your self.